Graveside service for Mildred Mae Mettler, age 99 of Shafter, will be Friday, February 1, 2019 at 10am at Shafter Memorial Park. Ruben Zartman will officiate. The family will receive friends on Thursday, January 31, 2019 from 4-8pm at Peters Funeral Home, Shafter. 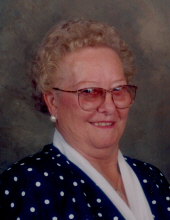 Mildred passed away on Friday, Jan 25, 2019 at Carrington of Shafter . She was born on Sep 23, 1919 in Medford, Oklahoma to Carl and Elizabeth Neumann. She was an active member of Ebenezer Reformed Church. Mildred was a 20 year member of AARP and went on many senior trips with that group. She also enjoyed ocean cruises with her loving husband, Delmer. She came from a large family and was a homemaker who enjoyed canning fruits and vegetables. Her love was making blankets for people. She is survived by her Daughter, Shirley Odell(Joe), Sons, Don Mettler(Mary), Ron Mettler(Lila), Michael Mettler(Vickie), 8 Grandchildren and 4 Great Grandchildren. To send flowers or a remembrance gift to the family of Mildred Mae Mettler, please visit our Tribute Store. "Email Address" would like to share the life celebration of Mildred Mae Mettler. Click on the "link" to go to share a favorite memory or leave a condolence message for the family.